The Giffre Valley is one of France’s most renowned sites for quality ice falls and those who enjoy rock climbing will undoubtedly be interested in trying out this challenging climbing experience. With the guidance one of our English speaking professionals, you’ll discover special techniques and equipment required to climb a frozen waterfall. NB – the photo shown is ice climbing on a glacier in the Autumn. During the winter, ice climbing sessions generally take place on frozen waterfalls. Anybody looking for an exhilirating and physically challenging winter sport, unlike any other. Keen rock climbers will enjoy the new challenge of using ice axes and crampons in places of their fingers and toes! “Wild” frozen waterfalls offer a truly beautiful and unique environment that you’ll enjoy experiencing up close and personal with the help of a ZigZag high mountain guide. An entirely different winter activity accessible to all ages and levels of ability (no experience required). Conditions must be right for waterfalls to freeze in a solid and ‘safe’ manner, so ice climbing is generally only possible between December and February, during very cold periods. 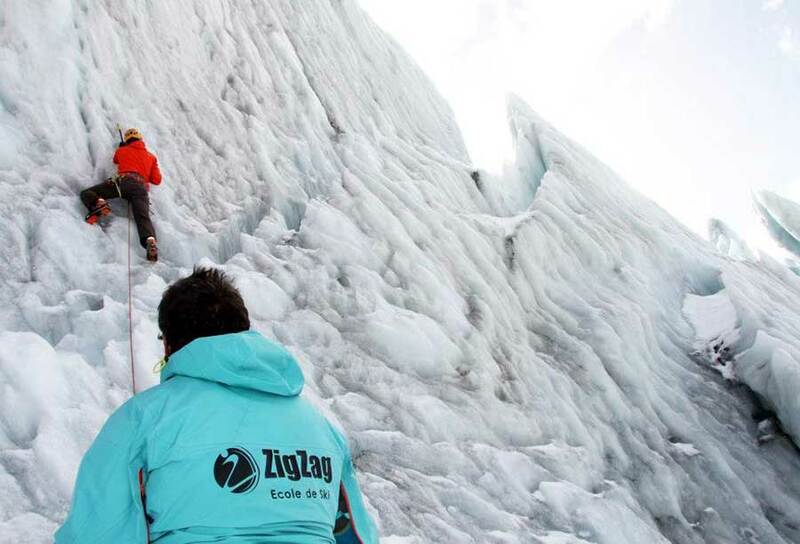 Your ice climbing guide will provide crampons, ice axes, helmet, harness, ropes and ice screws. You’ll need to hire cramponable mountaineering boots (available at Twinner in Samoëns’ centre), and to wear warm, flexible, waterproof clothing. You will need to wear warm gloves and to bring a picnic lunch.